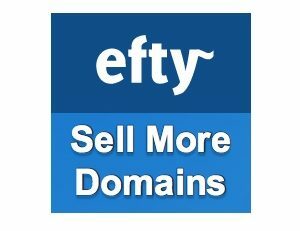 As domainers, we’re all business people, like it or not. 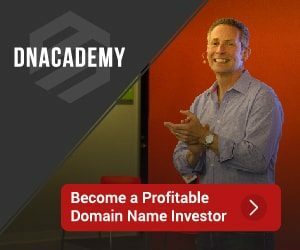 You’re either trying to sell domains at a profit or develop domains to make a revenue stream. That said, you have a reputation in the market place. Some have bigger or more well known reputations than others. For example, Rick Latona is on the “bigger” end of that scale. But whether you’re well known by many or mentioned by a few, it’s important monitor and influence what is going on around you. I have been hearing a lot about companies getting into the Online or Social Reputation Management business. What exactly is that? Let me answer with an example. A couple of weeks ago, I was having trouble with my Comcast cable tv service. While I was on hold with the company, I sent out a tweet along the lines of “On hold with a Comcast Rep is India for my TV in Chicago.” Within minutes, I received a reply form @ComcastMelissa asking if there is some way she can help. Clearly, Comcast is monitoring Twitter, and probably other social networks, in order to stay on top of customer comments. If you’re in a position similar to mine, it’s not economically feasible to hire a company to monitor mentions of “Sully’s Blog” and their probably isn’t a whole lot being said anyway. But It would be nice to pick up on the couple instances where there is so I could diffuse any issue or take advantage of a possible opportunity. There may also be some other key words or phrases that would be nice to monitor and this goes beyond Twitter and hash tags, a specific domain name I have my eye on perhaps. There are some free tools that can help you monitor and manage your online reputation. Here’s a quick and easy solution. 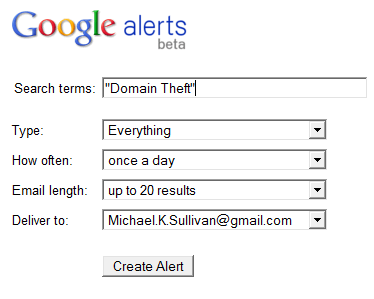 Just go to google.com/alerts. Here you can enter key words and Google will do the leg work of locating the information and e-mailing it to you daily, weekly, or as it happens. You can also preview the results for your query before saving it to ensure it is providing the types of results that you’d expect. Yext Rep is another free tool. It requires a bit more set up, but not complicated. Yext Rep finds posts where users have reviewed your business. 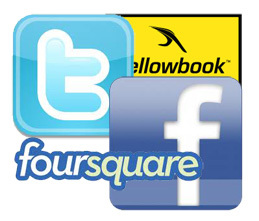 It monitors Facebook, Twitter, Yelp, CitySearch, FourSquare and more. 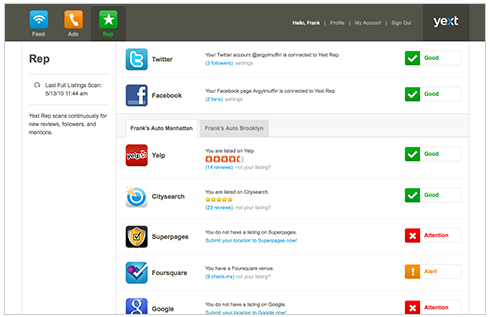 You’re notified from with in Yext Rep when a post mentions you and you can respond to the post from your dashboard. Users will be impressed by your ability to stay current with what is being said and you can promote your business or respond to issues easily. There is a multitude of pay tools out there that will help you manage your reputation as well. There may also be other free tools out there, but these are the two I have experimented with. I encourage you to take a look at these and at a minimum, do regular searches in Google and social media platforms to see what the buzz is around you, your domains, and your business. Thanks, I try to keep it a little different. No sense in providing what’s already available. Lol. I know. I was one of the last to move to cable internet. Not by choice, just by availability. Yes, I have a gripe about Comcast 🙂 Recently I had a rep visit trying to sell me on the XFinity triple play package which was supposed to be $89.99 plus tax. I would get additional channels, a faster internet connection, eliminate long distance charges, etc. I signed up but I just received a bill for $121.37. Does that sound like $89.99 plus tax to you? The New MySpace… Do you care?